It is today’s new reality: Our nation is in the middle of an opioid epidemic. Sadly and more routinely the statistics regarding the drug addiction crisis get worse, with my home state of Ohio leading the country in opioid overdose deaths. As a content creator with years of healthcare reporting experience, I thought I understood the problem—until an up close conversation opened my eyes. At a recent event for a client I was fortunate to hear from leading experts on why drug overdose deaths have increased more than 500 percent in the U.S. since 1990. The 19th United States Surgeon General, Dr. Vivek H. Murthy and the Acting Administrator of the Drug Enforcement Administration (DEA), Chuck Rosenberg participated in a Community Healthcare Forum with Cleveland Clinic CEO and President Dr. Toby Cosgrove. Their dialogue compelled me to share a few key points regarding the worst drug crisis in American history—a war that is escalating and will continue if we don’t fully understand the problem. A path paved with good intentions. Four out of five heroin users started from addiction to pain medication. “The United States is the world’s largest consumer of pain pills and there’s a relationship, both causative and correlative, between addiction to pain pills and addiction to heroin,” stated Rosenberg. The path to increased use of pain medications was paved with good intentions when just a few decades ago doctors, nurses and other health professionals were urged to treat pain more aggressively—and often told they were undertreating pain. As a result, since 1999 there has been a near quadrupling in the quantity of opioids prescribed and more than a quadrupling in the number of overdose deaths from opioids. “All without a significant change in the amount of pain reported by Americans,” Murthy said. The medical community is taking steps to change prescribing habits to treat pain safely and effectively through prescription drug monitoring programs, in addition to acknowledging addiction as a chronic disease. One way you can help is through talking with your friends and family about the reality of opioid abuse and gaining knowledge. The DEA’s documentary “Chasing the Dragon” is a must-watch first step. You can also participate in the DEA’s national Take-Back Initiative to anonymously and safely clean out your medicine cabinet. 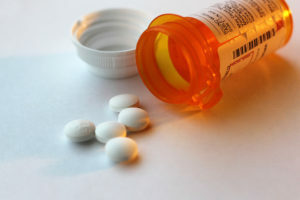 The program took in 900,000 pounds of prescription drugs in April, eliminating the temptation from pill addicts who steal from those who legitimately were prescribed the drugs. “Cleaning out your medicine cabinet is unbelievably important,” stated Rosenberg. It’s not all about heroin. It used to be if you heard about an overdose you immediately assumed heroin as the primary culprit. But, what are largely unrecognized are two new perpetrators: the synthetic opiates fentanyl and carfentanil, according to Dr. Cosgrove. To get an idea of the devastation these drugs can cause, Rosenberg gave this equation: Heroin times 50 equals fentanyl; fentanyl times about 100 equals carfentanil. “These facts should scare the hell out of us,” he said. China is the primary source for fentanyl and carfentanil, stated Rosenberg. Unlike heroin that has to be grown, harvested and shipped (usually from Mexico), synthetic opioids can be mixed in the lab. These drugs are easier to make and the profit margin is immeasurably higher. They are being laced into heroin and cocaine, replacing heroin entirely and being sold as counterfeit prescription medication. “It’s killing people sometimes on the first encounter,” stated Rosenberg. “Someone might think they’re taking heroin and they may have built up a tolerance to that level of opioids, but when taking something 50 to 100 times more potent that can rapidly depress their respiratory system, they are at much higher risk for an overdose death,” explained Dr. Murthy. Young and old alike. The opioid epidemic has no boundaries, regardless of age, race or socioeconomic standing—no one is immune, and that’s what is most frightening. In Northeast Ohio where I live, the Cuyahoga County Medical Examiner Office recently reported the median age for fatal drug overdoses is 35; a third of fatalities are those between the ages of 40 and 60. As I write this, a one-year-old has died of an opioid overdose in Akron, a city just south of Cleveland. Addiction is not a choice. It used to be the war on drugs was a war on those who used them. Today, we know addiction changes the circuitry in your brain. It’s also been established that 40 to 60 percent of your risk for addiction is linked to genetic factors. “Addiction is a chronic disease of the brain, and we should treat it the same way we treat [other chronic conditions, such as] diabetes and heart disease,” explained Dr. Murthy. This fact struck home just after Christmas this past year when my close friends lost their son to an overdose. He was 28, gifted and had just gotten married. He was a recovering addict who had been clean for several years; but, the pull was too strong and one encounter with fentanyl ended his life. Change the culture, change lives. We live in the most connected age in the history of civilization, but 40 percent of adults report they are lonely—a 20 percent jump from the 1980s. Understanding that emotional pain and sources of chronic stress, such as poverty and discrimination are all part of what drives the overall epidemic is one of the first steps to stopping the cycle. “We as a country have to make emotional well being a priority,” said Dr. Murthy. Listening to, and learning from, this conversation gave me hope that change will happen to save lives. And, I hope this information will empower you to help end the evil cycle of opioid abuse and make change happen. Beth A. Kapes is Founder & President, Moving Words Into Action, LLC. She loves telling the story that makes a difference! Beth is on LinkedIn and Twitter, or you can contact her at beth@mwaction.com.